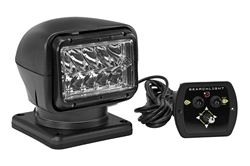 Golight Radioray Halogens are designed for off-road and utility use. The unit should be mounted outside of the vehicle during operation. It is not approved for roads or highways, underwater, inverted mounting or inside enclosed spaces. Remote options vary with the following selections: wireless handheld remote, handheld wired remote or hardwired dash mount remote. Model 2007 and 2057 come with wireless handheld and wireless dash mount remotes. When it comes to accessories, mounting shoes are compatible with portable mount models and security domes are compatible with permanent mount models. How you intend to use the light may determine the Golight Radioray model you need. Golight 7901 (white) and Golight 7951 (black) come with a magnetic mount base that is useful for moving the unit from vehicle to vehicle. Both products are seven inches tall, wide and deep, and support wireless remote control features up to 150 feet. Golight Radioray LEDs support similar permanent and portable mount options with its halogen counterparts. By comparison, the LED models display a more robust maximum beam distance and peak beam intensity with less amp requirements. Rockguards are not available for the Golight Radioray LED variants, and the housing features heat resistant, weather resistant and high impact injection molded properties. Golight Stryker lights are applicable for land and sea use. Most owners install the lights on boats, due to its weatherproof housing and UV/saltwater-resistant properties. Like the Golight Radioray line, such units are not designed for road use as a driving light, and are not approved for inverted mounting or underwater use. Remote and mounting variations are generally the same, as you would find in Golight Radioray products. With that in mind, the main focus of the Golight Stryker series are the lights. The light options include halogen, LED and HID. Out of the three, HID offers the strongest lighting power in the following categories: maximum beam distance, beam angle and candela. The LED model provides reliable mid-distance illumination and minimal maintenance (LEDs feature a solid-state design that allows it to tolerate rough treatment). In marine settings, it is useful for spread lighting on water. For specific lighting requirements, Golight offers a series of performance, work and off-road LED fixtures. The Performance Series includes a spotlight and a floodlight category with an A360 die cast aluminum housing and an IP67 approval rating. The main difference between the two are the quality and type of LEDs. Flood models come with 18 CREE high output LEDs and a 35-degree beam angle, while the spot models support 12 Osram high output LEDs and a 10-degree beam angle. During application, the flood version is suitable for locations that require a wider spread of light. The spot model is designed for accurate lighting requirements. The GXL LED Work Light Series is a versatile fixture that provides intense light. It is a compact, fixed-mount device that is suitable for long-term to permanent lighting requirements. This unit is one of the most unique products from Golight, due to its interchangeable lens covers. The spot pattern lens is useful for direct, long distance lighting; the flood pattern lens offers horizontal spread lighting, and the hybrid lens combines the features of both lens. By default, a standard flood lens comes pre-installed on the unit. The GXL LED Off-Road Series is ideal for outdoor use and rough environments. To ensure performance under extreme conditions, the light supports air induction port technology. This takes place on the unit’s aluminum cooling fins at the front of the light. By design, the fins utilize air from outside sources to cool the device. The unit comes with an IP66 approval rating and is suitable for fixed lighting requirements in rugged settings. There are several general points to consider when purchasing a Golight. Some units offer wireless remote control options that may interfere with communication devices. When using electronic equipment (two-way radios, hearing aids, pacemakers and etc. ), one should note that all of Golight’s receivers and transmitters operate on 433MHz. To avoid interference, operators should keep the light and affected device far away from each other. Golights cannot rotate continuously for automated monitoring and security. Rotation must be initiated manually by pressing/depressing a button on the remote. Lastly, mounting options vary greatly; hence, it is recommended to assess your lighting needs prior to selecting a Golight product.